BuildEx Construction LLC > Blog > Uncategorized > Easy Tips For Covering Your Windows! We all have windows, and they are designed to let in air and sunshine. But we also need to cover those windows sometimes to keep the air and sunshine out — not to mention for privacy. There are some simple solutions, and we have some super tips for measuring and installing window coverings. There basically are two ways to cover your windows: You can mount the window coverings inside or outside the window frame. An inside mounting usually will let in light around the edges, but will let you add drapes if you want. When you measure the windows for this type of mounting, measure it at the top, from the widest part of the inside frame, in the middle and again at the bottom of the window. Then do the same thing with the height. These measurements are critical for this type of mounting, so make sure they are correct before shopping. Also, you will need to check the mounting brackets to make sure they will fit, too. An outside mounting means the window covering will cover the window and frame, so little light gets in. It also allows for a little more error in measuring. 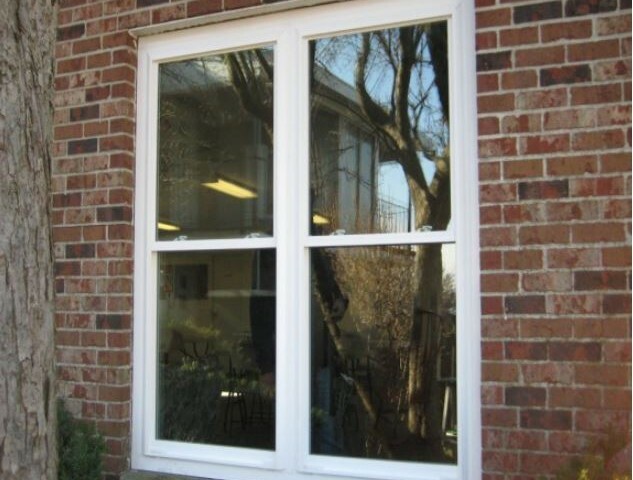 Measure the width of the window, including the frame, and then add 1.5 to 3 inches on each side. Do the same thing for the height. When you have all of your measurements, you can start shopping. If you can find standard-size window coverings to fit your windows, you usually will save money. There are some cut-to-fit blinds and shades. These are pretty easy to use. There also are some great deals online, even if you need to have your window coverings custom-sized. Use good wall anchors. If the ones that come with your window coverings don’t look sturdy enough, buy better hangers at your hardware store. If you use good hangers, they will stay up forever. Don’t forget to use a level, too. Some inside hangers are held in place by springs, which means there is no hardware installation. These work only if they are a good, tight fit. You don’t want them falling down every time you raise or lower the covering. Having the same window coverings throughout the whole house will look better than having something different in each room. Working while on your back usually is not very comfortable, especially when you are in the dirt under your house in your crawl space. Try an inflatable swim raft to make things more comfortable. The raft might not survive the ride, but it will make the work a little more tolerable, and a cheap raft will only cost you a buck or two at the discount store. You just might be so comfortable you’ll decide to take a nap. Probably not, but at least you can get the job done! We always use a golf cart these days when golfing, but we also try to recycle things we no longer need. An old golf-club bag placed in a wheeled carrier makes a great yard caddy. Fill that old golf bag with yard tools like rakes, hoes and shovels, and wheel it around your yard as you work. Your tools will be super handy, and you’ll love the ease of it. You even can stuff work gloves, seed packets and other smaller items into the pockets of the golf bag. When you are finished working, just wheel it into the garage or shed, where it will be ready to go next weekend. • If you think you might have missed a few gaps around your windows or doors, do the incense test. Light some incense and hold it in front of the areas where you think the leaks are, and you will see the smoke move very quickly if there’s a leak. Then you can fill those gaps when you get a chance. • If your water heater is located in the attic, garage or basement, then wrapping it in an insulating blanket made for your water heater can keep it warm longer and save you money on your utility bills. These are available at your home center and will pay for themselves in just one season for most folks. They are easy to install, too. • If you are tiling a floor and don’t want to buy a ton of plastic spacers, or just want a smaller gap between the tiles, use a penny. They are easy to use, easy to remove and cost, well, pennies! Q. I am having a problem with my clothes dryer. It turns off before the clothes are dry. It does heat up, but it just shuts down too early. Can you give me a few things to check before I call someone in to fix it? A. The first thing to check is the exhaust duct. These can be clogged with lint and can cause the dryer to overheat when it’s running, which will then cause it to shut down or catch fire. Check your hardware store or home center for a flexible tool that will clean out your ducts, and see if that takes care of the problem. Q. I am trying to finish out my basement so we can use it as a family room. Currently the walls are just the standard concrete block. I plan to install wood paneling. What do I need to put between the concrete lock and the paneling? A. You need some type of vapor barrier between the concrete and the paneling to prevent moisture problems. This can be just a sheet of plastic as long as you tape each piece to the next one. You might also want to add some foam insulation panels behind the paneling if you need more insulation. Make sure you let the paneling acclimate to the room for several days before you install it, and give it room to shift a little as well. Q. I want to paint my bathroom walls but they are made of some type of vinyl. What type of paint should I use? A. Scuff-sand the walls to take the gloss off them. Then use a primer and paint. The glossier the paint, the easier it will be to clean later on. If you have the option of adding a mildewcide to the paint, do so to inhibit mold and mildew. • I had to remove the housing on my lawn mower to make some repairs, and I had two very stubborn screws. I guess they had just been in place too long and maybe got a little rusted. I tried just about everything I could think of, but nothing would work. I finally got my soldering iron out so I could hold it on top of the screw to heat it up. It worked on both of them! Thank goodness! • We have a closet in our garage that is great for storage but was always a hassle to get in and out of because of the doors. I took the doors off and converted them to sliding doors. Now I can get into the closet more easily and we don’t have to back the cars out to do it. These “pocket doors” really are neat. I may have to add some indoors, too. • I bought a large bucket of glossy white paint and decided to paint my workshop with it. Wow! It made a huge difference! Now I can see so much better. The white, glossy paint reflects so much light, and sometimes I don’t even need to use the extra lights to see what I’m working on. • Our refrigerator was not working like it used to. I finally called a repairman to fix it. It turned out that a mouse had gotten stuck in the fan and died, and was preventing it from turning. I was embarrassed for sure, but glad it was only a small problem. I should have looked a little closer when I was cleaning. • I keep my sliding glass doors very clean since they offer the best view of the mountains near our house. But I have almost run into it a couple of times, and the worst was when my dog DID run into the door. I knew I had to do something, but I wasn’t really sure what I could do that wouldn’t mess up our view. I bought some very simple decals to place on the door at eye level for humans and pets. They are hardly noticeable to most people, but my dog hasn’t made that mistake again, and I don’t think I will have to worry about anyone else running into the doors. • Vinegar is one of those everyday household products that we all have in our homes. It has tons of uses there, as well as in the shop and even outdoors. It’s really inexpensive and can save you money in many cases. We have put together a list of some of our favorite, tried-and-true uses for the stuff. You also can get this information, as well as a lot of other interesting tips, on our website at www.thesuperhandyman.com. We hope to hear from you soon. Have a super day! • Black & Decker’s new Gyro Screwdriver is a super little tool that every homeowner will really get a lot of use out of. Its compact size means you can keep it handy inside the house or in your toolbox. It has an onboard LED light to help you see what you are working on, even in a dark closet or under your sink. The gyroscopic feature allows you to change the direction and speed of the screwdriver by repositioning your wrist. A lithium battery keeps a charge for a long time (up to 18 months) so you won’t be without it when you need it. To see it in action and learn more, visit www.blackanddecker.com or at your favorite home center or hardware store. • E-Z Fuse Tape is made by the SuperGlue folks, so you know it’s going to take care of your glue repairs. Its bond is permanent and stays flexible while on the job. It’s waterproof, nonconductive, insulating and weather-resistant. You can use it on garden tools, sporting equipment, automotive repairs and lots of other things. It’s available in several sizes and colors, and it’s super easy to use. Check it out at your home center or hardware store, or online at www.supergluecorp.com.